The Henley Standard's David White was able to catch a word with Leander Club's Finn Stevenson, who was part of the crew which beat Cambridge in the Visitors' Challenge Cup. He spoke to us immediately after the verdict was announced, a nerve-wracking half an hour or so after the crews returned to the bank. He told us: "There was an appeal. Personally I didn't see why Cambridge were appealing, but they felt there was something. The umpires have gone and had a look at it and the verdict stands. It feels fantastic. It was really hard but that was our plan, to go out and get in front and control the race and to not let them come into it." Well that's it for another year, Henley Royal Regatta 2017 has finished, with four wins for our local clubs, a few upsets and some phenomenal rowing, not just around finals day but throughout the event. Leander Club picked up the trophies today (see pictures) but fantastic and inspiring performances from Henley Rowing Club and Shiplake College throughout the five days ensured that local followers of rowing had plenty to cheer on over and above the spectacle and excitement of Henley Royal Regatta as a whole. Thank you for joining us, Facebooking and Tweeting and don't forget to pick up this week's Henley Standard for more coverage, pictures and reaction of one of the highlight's of the town's calendar. It's our last race of the day (where did the time go? How are we over for another year?) and it's the coxed fours. St. Andrew's went out hard and first early, setting the pace and establishing a lead against the Norwegian crew. The Norwegians stayed close but kept steady, and clearly had a race plan to make their move and take the race in the second half of proceedings. The did so, putting on the sprint in assured fashion, powering past St Andrew's and leaving them unable to counter the manouevre. It's only the third time a Norwegian club has won at Henley but they did so in style. They finished a length ahead of their opponents, in a time of 7.06. A thrilling race for the penultimate one of the event. It was a David and Goliath encounter, with 81kg American John Graves against 74kg New Zealander Matt Dunham. A focused and powerful start by Matt Dunham but the heavyweight American took the lead and commanded the course for the first half. But Dunham just kept pushing and when he was ready to make his move he went for it with power, precision and a tenaciousness that left the crowds on the bank screaming. He came from several lengths back to finish one and three quarter lengths ahead in a time of 7.34. Really exciting scenes and one of the races of the day. 4.15pm Visitors' - following the appeal umpires have confirmed a Leander win in the Visitors' Challenge Cup. Big cheers from the tent as it was announced. They officially won with a verdict of three quarters of a length. Defending champions Gloucester have won the last three years and the power and precision of their row perfectly illustrates why. Isle of Ely did everything they could to keep contact and had a fantastic row of their own, but it just wasn't enough to keep up with dominant and efficient Gloucester crew who moved out at the half way point and just kept extending the lead. They crossed the line two and a quarter lengths ahead, in a time of 7.36. Thames Rowing Club A took the early lead, but there was a great performance put in from the B crew, who sat around a length behind them during the early part of the race. By the enclosures the A crew had opened up a big lead, with solid technique and neat puddles that the B crew just couldn't counter. Thames A won by five lengths. Controversy in the Visitors' final, with the result currently under appeal. Leander last won in 2007, although some of its members have been part of winning composite crews since then. Both crews started strong and neatly, although Leander needed to make an adjustment early on for steering. Despite this they were still able to establish an early lead which they kept up throughout most of the race. Cambridge started a sprint at the enclosures but Leander countered, ensuring that they crossed the line half a length ahead. Cambridge appealed the result in light of umpire's warnings on steering for the Leander crew. The race umpire has asked both crews to come to the committee lawn once they put their boats away. We await confirmation of the result. John Collins, was three seat in the Leander crew that won the Queen Mother, beating a crew from Wairiki, New Zealand by three quarters of a length in a record-breaking time of 6.13. He told Henley Standard reporter Jamie Presland: "We got out quite strongly and got in to our rhythm. "We got ahead but they kept on attacking so we had to work hard, hats off to them." Pete Lambert added of breaking the record: "We knew records were tumbling today and we had a good race so we knew it was on. "Fair play to New Zealand, they did push us the whole way and we broke the longest standing record at the regatta." Another new women's event for this year sees the assembled crowd getting a chance to see Olympians from the US and New Zealand squads go head to head. Kiwis Kerry Gowler and Grace Predergast started cleanly and put in a well-rhythmed cohesive row. They established an early lead over American pair Megan Kalmoe and Tracy Eisser, but weren't lulled into a false sense of security, keeping the pace up and ensuring there were no surprises, even when the Americans pulled a burst of speed out of the bag in the final 500m or so. Gowler and Predergast finished two and three quarter lengths ahead of their opponents in a time of 7.48 and their names will be the first engraved on this new trophy. Germans started aggressively, blasting out to get a purposeful early lead. The Leander Newcastle composite stayed close but by the time the two crews had reached the enclosures the Germans were well clear of their opponents. The finished the course with a verdict of a length on their opponents. Another new event at Henley this year up now, the women's fours. Hollandia, which is effectively the Dutch U23 international crew, took an early lead in the first few hundred metres after the Americans suffered a steering incident in the early part of the race. The Dutch crew looked fluid and almost effortless working down the course, taking advantage of the headwind to keep a good distance from the New Yorkers. Hollandia won, crossing the line three lengths ahead of their opponents in a time of 7.14. New Zealand's John Storey and Chris Harris face French lightweight Olympic champions Pierre Houin and Jeremie Azou in this double sculls final. The Kiwis were 15kg a man bigger and used their weight and power to push their way along the course. The French pair rowed a highly synchronised and technical course, but just couldn't keep up. Some steering issues for the Kiwis as they reached the enclosures, but their lead was such that it didn't make a difference. Now onto the women's eights. The Kiwi crew powered off fast, with a clean and neat start. The British crew started slower, but their relaxed poised style kept them close for a great part of the race, even in the face of the New Zealand crew's greater power. The Kiwis sped along the course on at top pace, but the British crew kept some overlap, staying in touch as the two crews reached the enclosures. Both crews went all out in the last few hundred metres, with Waiariki opening up the gap, crossing the line two thirds of a length ahead of their opponents. A great win for New Zealand but a great row for the young British crew who were such worthy opponents. Waiariki Rowing Club, New Zealand wins The Rememnham Challenge Cup. We thought this was going to be a memorable race, but it has been for all the wrong reasons. A walloping start from Thiele saw her nudge the early lead. Leander's triple Olympic winner Vicky Thornley has been on great form and evverything was set for a great and even race. But by the half way point it became apparent Thornley was having some kind of problem. It was unclear whether it was an issue with her boat or some kind of injury, but suddenly she was doing a lot of work with her left hand scull, with her boat switching and sliding between strokes, despite her manouevring her left shoulder widely to try and keep the boat steering straight. Thiele stayed steady and kept rowing at a good pace, and crossed the line far ahead Thornley, recording an unexpected Easily verdict. It was a win but not the great fight that was expected. Annekatrin Thiele wins the Princess Royal Challenge Cup. A hotly-contested final for the Princess Elizabeth saw the umpire warn the crews at the start to keep their eyes in their own boats in the face of some pretty blatent gamesmanship. Scotch's bladework was a bit choppy and at times not synchronised, but what they lacked in cohesion they made up with power. By the half way point Radley were more than a length behind and despite an effort at pulling back as they entered the enclosures they were just not able to pull things back. There hasn't been an Australian win in the Princess Elizabeth since 2001, with Eton and Abingdon School sharing the spoils over the last decade or so. But the Aussie crew, who rowed against the best the UK schools system has to offer along the way, were well deserved winners, finishing in a time of 6.29 with a verdict of one and two third lengths. We're back from lunch and we're going to be busy - three of the next four races have local Leander rowers in them. First up is the men's quadruple sculls. A great start from both crews, and an early lead from the British crew. Leander was stroking 37 a minute, with the Kiwis managing 38 but the power and precision of Leander kept them about half a length ahead working to extend their lead in the middle section of the race. By the middle of the course Leander were working hard to move further away, but the Kiwis wouldn't let them do it, keeping contact the entire time. By the enclosures both crews were sprinting, with Leander getting a warning for moving off their station from the umpire. New Zealand tried to take advantage, but they just didn't have enough in the tank to manage it. A tough contest with Leander working hard for the win, finishing two seconds ahead of the course record, three quarters of a length ahead of their opponents. Leander Club wins The Queen Mother Challenge Cup. Henley Standard reporter David White has spoken with two victorious Leander rowers following their victories in the Prince of Wales and Stewards' events respectively. Harry Glenister rowed in the Leander A crew which beat their B crew colleagues in the Prince of Wales - and has even more to celebrate having made history establishing a brand new record that has eluded even the most illustrious rowing names. He told us: "It's amazing. I'm really happy with the result. "I've made history as I'm now the first person to win all three quad events at Henley. I was really nervous, especially against our B crew as they have got a lot of international experience. It was weird in the changing rooms before and in the crew room being with your opponents but there was a bit of banter." To add to the celebratory atmosphere, it's actually Harry's birthday and he has turned 22 today - but there's no time for partying: "I'll probably have a few drinks afterwards, not too much though because we have got training for the U23s in two weeks. It was really good conditions out there, they made us fight for it all the way." Leander were also victorious against the Italian Olympic team in the fours in the Stewards' Challenge Cup. Leander's Matt Rossiter and Will Satch were in the winning crew, alongside Molesey Boat Club rowers. Matt Rossiter said: "I'm ecstatic. I've only been in the four for a month or so so it's been a work in progress. I only joined the national team in September. All the other guys in the boat have been so supportive and taken me under their wing. We talked about putting in a good start this morning and we absolutely executed it. The fours lost to Italy in the last race, I think Henley is just different." "[Molesey's] Moe [Sbihi] is an Olympic winner in the four and he called the race absolutely perfectly. I was at Abingdon School and since I was 14 Henley was always the goal. It's absolutely awesome. The goal of the season now is the World Championships in Florida, and this is a really good step on. All my friends and family are here and I'll savour the moment - and then it's training tomorrow morning." Both crews took off furiously fast - Brookes clocked 43 strokes a minute to the Molesey and London crew 44 strokes a minute. Brookes put in an assured performance, hitting their rhythm and then extending their lead. Their opponents put in a push shortly before the enclosures but there just wasn't enough water for them to make up the gap. Oxford Brookes finished three quarters of a length ahead. Oxford Brookes and Taurus Boat Club win The Ladies Challenge Plate. We spend a lot of time on Twitter using the hashtag #localpride in recognition of the local rowers who take part and excel at Henley Royal Regatta. If there was ever a race that typified that it would be this, where two Henley-based Leander crews went head to head. The two crews had breakfast together this morning and are apparently firm friends of the water but, as expected, they put on a masterclass of powerful and efficient rowing, flying along their home water. Both crews settled into a rate of 38 strokes a minute early, but longer and more powerful strokes from the A crew saw them pull ahead. The B crew fought hard to keep overlap but in the end the A crew were just uncatchable. Leander A finished one and a quarter lengths ahead in a record time of 6.22. Leander Club 'A' wins The Prince of Wales Challenge Cup. The first ever Women's Double Sculls final at Henley saw a great performance from the New Zealand crew, Brooke Donoghue and Olivia Loe. The pair started neatly and found their rhythm quickly. Dutch crew Oldenburg and de Jong did everything they could, but just couldn't equal the power of each stroke. By the time they crossed the line the Kiwis were four and three quarter lengths ahead, having received warm applause from the crowd passing Stewards. Donoghue and Loe win the Women's Double Sculls. A really exciting and speedy race between two Olympic crews. If after all the weed-pulling the Regatta powers that be wanted to make back some time then these two pairs were keen to do what they could to help. Josh Dunkley-Smith and Josh Booth, both from Melbourne, were Silver Olympic medallists in Rio. Meanwhile the Onfroy brothers, Theophile and Valentine, both rowed in the French coxless fours at the same event. The French crew moved off with a lot of power, while the Australian crew looked more neat and restrained although both crews clocked a rate of 40 strokes a minute from the beginning. The French brothers took a half length lead in the first few hundred metres, before either crew had found their rhythm. The Onfroy brothers on the receiving end of an umpire's flag for steering, being told to move back to their station. They adjusted, but didn't let it affect their sprint, riding the tail wind and staying flat out for the entirety of the course. The Aussies kept up admirably, but the French crew did not take their foot off the gas, finishing at 42 strokes a minute. They didn't stray below 40 the entire way down the course. A deserved win for the French brothers who finished two lengths ahead. Another lengthy delay while the lifeguard boat tackles weeds being blown onto the course. Both crews came out cleanly, with the coxes steering strong lines. Oxford Brookes nudged ahead in the first few hundred metres, but there was hardly anything in it with both crews putting all their power in early. By the first 500m defending champions Oxford Brookes had pushed past the pain to break away by a length or so. The set a smooth and calm rhythm while University of London looked slightly more frenetic as they fought to remain in contention. At the enclosures London upped the rate and began to pull back the lead. But in the final stages of the race they were still three quarters of a length down with Oxford Brookes holding their nerve to take the win, finishing three quarters of a length ahead. Oxford Brookes University wins The Temple Challenge Cup. An on-form Hollandia put on an assured display here, having been a class act all week. Nottingham and Warrington had steering issues close to the boom by the Berks station, which impacted on the speed of their start. Hollandia in comparison started well, getting into a strong rhythm early that allowed them to increase their lead with every stroke. By the Barrier, the Dutch crew was several lengths ahead and looking comfortable. 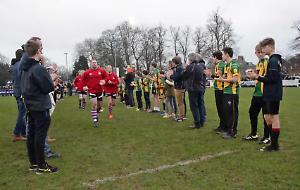 Their rate stayed high, but Nottingham and Warrington weren't close enough to be in contention without an error or calamity befalling Hollandia. The British crew had seemingly conceded by the enclosures, moving into the middle of the course. Hollandia finished four and a half lengths ahead. Hollandia Roeiclub, Netherlands wins the Princess Grace Challenge Cup. A nerve-wracking ten-minute delay for both crews while a lifeguard boat cleared some weeds on the course, possibly from where the wind has blown them out from the Island. Goodness knows what was going through the crew's minds as they sat waiting for the go-ahead - but every minute that passed where they're sitting motionless negated their warm up a little more. Both crews moved into the middle off the start, with the umpire warning Tideway Scullers' to move back towards their station. Tideway Scullers' nudged ahead, but it wasn't even a canvas at this early point. In the mid section of the race Sport Imperial made a move, pulling two lengths ahead. Scullers increased their rate but a slight mis-steer saw Scullers move towards the booms which slowed them slightly as they corrected themselves. The error cost them dear as they weren't able to cut the lead. By the enclosures Sport Imperial looked comfortable with their lead and crossed the line two and a half lengths ahead. Sport Imperial wins The Wyfold Challenge Cup. A thrilling match between the two schoolboy crews, began with Umpire Sir Matthew Pinsent giving Claires Court a warning for steering into the middle off the start, leaving Windsor moving back towards their own station to avoid a clash. Windsor pulled ahead, taking advantage of the steering to pull a lead of about a length. At the enclosures Claires Court pulled out all the stops with a decisive move, powering ahead to close the gap. Claires Court nudged ahead momentarily, but Windsor increased their pace to pull things back. At Stewards Windsor started a sprint, while Claires Court increased their rate to counter. But Windsor kept their nerve and despite defending champions Claires Court giving it their all to the finish the title went to Windsor who finished half a length ahead. Windsor Boys' School win The Fawley Challenge Cup. It's a beautiful and sunny morning with some strong tail winds which should see for some nice speedy race. The first of our 23 races of the day is in the coxed fours, with two of the country's best university crews going head to head. Imperial started on the Berkshire station, with Newcastle taking Berks. Newcastle got away cleanly and nudged ahead early, but Imperial stayed close, remaining in it and pushing ahead just before the Barrier. Imperial led at the Barrier, reaching it at 1.57, equalling Newcastle's existing record, but the lead they kept was momentary, with a magnificently decisive move mid race from Newcastle saw them push ahead. By the grandstands Newcastle were looking the stronger crew, but they still hadn't broken away, leaving Imperial with a length to try and make up. They put in a sprint, but it just wasn't enough. Imperial will obviously be disappointed by the result, but can take some comfort from having set new records at both the barrier and Fawley (3.18) with Newcastle's 6.48 finish making for a hat trick of records in this cup in these glorious conditions. Newcastle lost in the final last year by a length, but this year they were able to win by two thirds of one and shaved six seconds off the existing tournament record to boot. Newcastle University wins the Prince Albert Challenge Cup. 11am Good morning and welcome to Henley Royal Regatta 2017 Finals Day! It's been a thrilling regatta so far, and we've got lots to look forward to today, with plenty of local crews vying to bring trophies (or rather mostly cups and plates) home. The first session of racing will run from 11.30am to 1pm, and we've got several Leander crews making appearances this morning, most notably at 12.40pm in the Prince of Wales Challenge Cup when we've got a guaranteed Leander winner as the Club's A crew takes on the B crew. Stay with us all day for all the results, as well as reaction and photos from our reporters at riverside, who are catching up with crews and coaches as soon as they get off the water. Also follow us on Twitter @henleystandard for more informal (and faster!) chat.